PERMODALAN Nasional Bhd (PNB) will continue to buy more properties in London despite aborting its plans to acquire an office building there. President and group chief executive Tan Sri Hamad Kama Piah Che Othman said the decision to not pursue what could have been PNB's fourth property in London was due to "it not meeting some of our criteria". "We identified the property and after doing our due diligence, we decided not to buy but this does not mean that we will stop looking for the right investment," he told reporters here yesterday. A news report on Tuesday said the office building called Woolgate Exchange was to be acquired by PNB for some RM1.3 billion. Hamad Kama Piah said PNB had spent RM4.88 billion on properties abroad since 2010, including one in Australia and three in London. PNB's three London properties are One Exchange Square, 90 High Holborn and Milton and Shire House while in Brisbane, it is an office block called Santos Place. PNB hosted a gathering of the fund manager's group of companies participating in its coming 13th Minggu Saham Amanah Malaysia (MSAM). MSAM is aimed at educating the public on investment, while encouraging them to participate in the unit trust industry. To be held in Kota Kinabalu, Sabah, from April 20 to April 28, twelve PNB subsidiaries are taking part along with 38 other participants including regulatory agencies, government agencies, PNB's unit trust agents, companies from Sabah and the media. Its key partners are Malayan Banking Bhd, Sime Darby Bhd, I&P Bhd and UMW Holdings Bhd. Others include Chemical Co of Malaysia Bhd, Malaysian Industrial Development Finance Bhd, MNRB Holdings Bhd, NCB Holdings Bhd, Perusahaan Otomobil Kedua Sdn Bhd and Projek Lintasan Kota Holdings Sdn Bhd. "We are targeting 200,000 visitors this time around and hope to be able to showcase to them (PNB's unit trust investors) the companies we are investing in so that they are aware of where their money goes into," said Hamad Kama Piah. 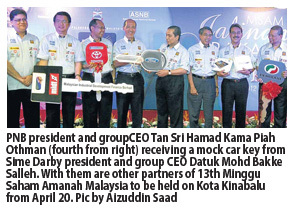 MSAM 2012 will offer grand prizes to some lucky visitors such as a Ford Fiesta 1.6L (from Sime Darby), a Toyota Hilux from UMW Holdings, and a Perodua Myvi 1.5 Extreme.